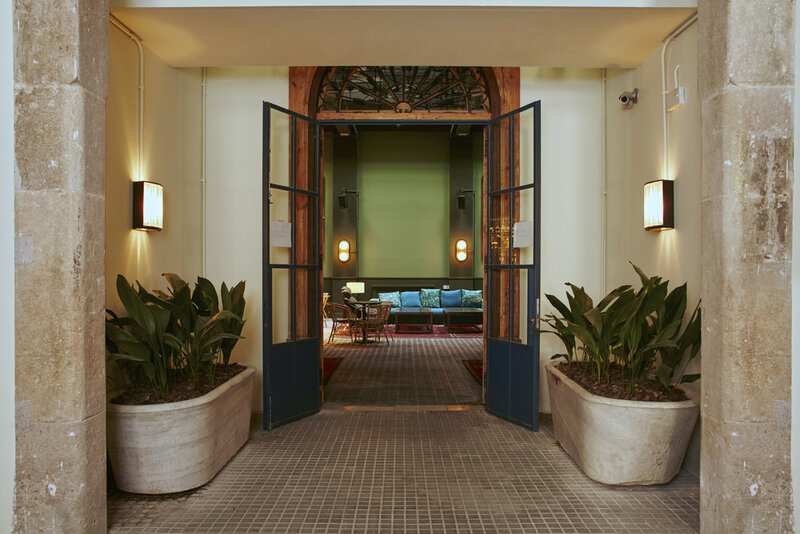 Barcelona is not short on smart boutique hotels. The new Casa Bonay could be dismissed as another, were it not for its tangible personality, meticulous restoration and handpicked ethos. The original ‘casa’, which is situated in Barcelona’s Eixample district on the Gran Via and very close to the Plaça Tetuan, once belonged to Antonio Bonay, who had a prosperous wood and carpentry business. It dates from 1869, and like many buildings in the area of the same epoch, features galleries and balconies, French doors and a regal threshold- in this case with magnificent carved doors made of fine wood. The interior, as was fitting for a family of the bourgeoisie, was noted for iron columns, sculptured corbels, marble fireplaces and Nolla patterned floor tiles. (Nolla floor tiles were made of stoneware, and considered superior quality to those made of tinted cement). Abandoned for decades, much of these elements were in a deplorable state when Inés Miro-Sans decided to turn the Casa Bonay into a hotel. Although the structure had to be completely remodelled in order to accommodate 67 hotel rooms, the restored common areas provide a snapshot of the building’s glorious past juxtaposed with a modern design ethic, ‘makers’ attitude, and considered selection of details. Perhaps the most spectacular space in the hotel is the ground rear floor room - now a lounge area named ‘Libertine.’ Its décor features muted green walls, clubby furniture, Moroccan rugs and is reigned over by Antoni Arola’s ‘Cirio’ suspended light flitting – a spectacular circular composition inspired by the grand lamps of Istanbul’s Hagia Sophia mosque. The café area, with bare brick walls and pine furniture is more Scandinavian in style, and has stations for coffee from the craft roasters of Satan’s Coffee Corner and Mother cold pressed juices. Opposite the reception desk, there’s a pop up shop of shirts from baTabasTa, whose retro tropicalia prints have been made into wallpaper for the downstairs areas. Another inspired idea is the installation of a mini shop in the original, enclosed concierge desk retailing in Blackie Books – the Barcelonese publisher with the most inspired illustrated covers around. The rooms at the Casa Bonay are less composed– the rich floor tiles have been salvaged where possible and bathroom fittings nod to original styles. Beds are swathed in luxurious yak blankets from Teixidors, the Terrassa-based textile company run as social enterprise, and the sunny rear balconies look out onto one of the widest pati interiors in the Eixample. The intricate mise en scène that Inés has created in her hotel doesn’t result in it feeling ‘branded’ or ‘on-trend’, but rather the vision of someone with an eclectic taste and eye for quality. Already it has become popular with local mums for a drop-in coffee and travellers looking to tap into something genuinely Barcelonese.